By CE Pro Editors · September 6, 2018 • Celebrating the most noteworthy new products and technologies of 2018, the CE Pro BEST Award winners are honored this week at CEDIA Expo 2018. 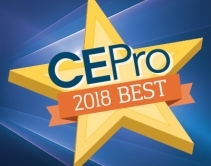 By CE Pro Editors · July 30, 2018 • The 2018 BEST (Best Electronic Systems Technologies) Awards deadline has been extended to August 3, 2018. This is the last chance to have your product honored at CEDIA Expo 2018. By CE Pro Editors · July 23, 2018 • This is the last week to enter for the 2018 BEST (Best Electronic Systems Technologies) Awards to have your product honored at CEDIA Expo 2018. Final deadline is July 27. By CE Pro Editors · May 25, 2018 • Enter now for the 2018 BEST (Best Electronic Systems Technologies) Awards to have your product honored at CEDIA Expo 2018. Final deadline is July 27. By CE Pro Editors · May 7, 2018 • Enter now for the 2018 BEST (Best Electronic Systems Technologies) Awards to have your product honored at CEDIA Expo 2018. Early-bird deadline is May 25. Final deadline is July 27. By CE Pro Editors · September 9, 2017 • Recognizing the most noteworthy new products and technologies of 2017, the CE Pro BEST Award winners are honored this week at CEDIA 2017 in San Diego. By CE Pro Editors · July 18, 2017 • 2017 CE Pro BEST Awards @ CEDIA includes new product categories for voice control, fiber optic cabling and video doorbells. By Chelsea Cafiero · June 2, 2017 • Enter now for the 2017 BEST (Best Electronic Systems Technologies) Awards to have your product judged by an expert industry panel and honored at CEDIA 2017. The final deadline is August 7. By CE Pro Editors · September 16, 2016 • Winners reflect the most noteworthy new products and technologies of 2016, recognized this week at CEDIA 2016. By CE Pro Editors · August 4, 2016 • Entries are being accepted through August 8 for the 2016 CE Pro BEST Awards, which recognize noteworthy new products and services for the residential custom electronics industry, presented at CEDIA Expo 2016. By CE Pro Editors · September 13, 2014 • Awards recognize the most noteworthy new products and technologies for 2014, to be presented at CEDIA Expo 2014. By CE Pro Editors · July 30, 2014 • August 1 is the final deadline for manufacturers to submit their products in 31 categories for the 6th Annual CE Pro BEST Awards @ CEDIA Expo. By CE Pro Editors · July 25, 2014 • Next week (August 1) is the final deadline for manufacturers to submit their products in 31 categories for the 6th Annual CE Pro BEST Awards @ CEDIA Expo. Show us what you've got!